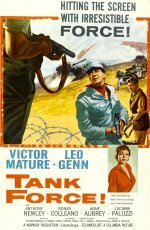 Daniel Thatcher is an American sergeant serving with a British tank corps in North Africa. He and most of his unit are captured by the Germans, who learn his identity as a man who once tried to assassinate Josef Goebbels, Hitler's right-hand man. Thatcher's wife was killed in the concentration camps, and now, after his failed attempt to kill the Nazi leader, Thatcher is a real prize for his captors. But Thatcher prefers not to go back to Germany as a prize, so he leads his fellow tankers in an escape attempt.